If you’re staying in this Valentine’s Day, may I suggest cooking up this special dish? I prepared it a couple weeks ago for a wine company that I’m doing some freelance work for. Creamy risotto is livened up with a bit of fresh lemon and lively tarragon, setting the “bed” for these perfectly seared scallops. 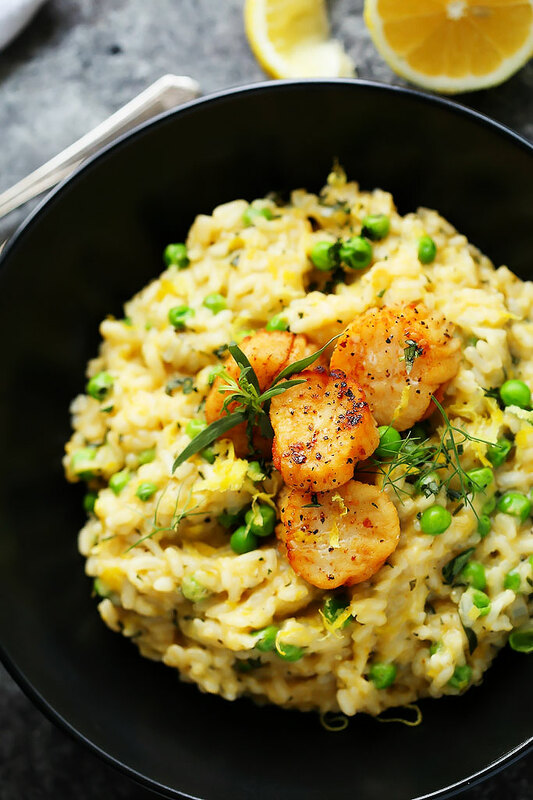 This scallop risotto is also a perfect dish to cook as a couple as one of you can be working on the risotto, while the other can be setting the table, popping the bubbles, and searing the scallops at the last minute. Just add red roses and candlelight… It might even be a good idea to check if your local market carries fresh-shucked oysters. They’d be the perfect way to start things off. And to finish, may I suggest either this Crème Brulee or these Butterscotch Bourbon Budinos with Salted Caramel Sauce? With both of these desserts, the work can be primarily done ahead of time, leaving you free to just enjoy your evening with the one you love. Do you tend to stay in or go out for Valentine’s Day? I’d love to hear how you like to celebrate in the comments below! Bring bone broth or chicken stock to a simmer in a small saucepan and keep warm over low heat. Heat oil in a large saucepan or dutch oven over medium heat. Add leek and shallots to pan, cook until tender, about 7 minutes. Add rice and cook 1 minute, until it becomes translucent. Add vermouth and allow to evaporate, about 30 seconds. Stir in 1 ladle of stock and cook until the liquid is nearly absorbed, stirring constantly. Add remaining stock, 1 ladle at a time, stirring constantly until each portion of stock is absorbed before adding the next (about 25 minutes total). Stir in frozen peas and cook 1 minute. Remove from heat. Stir in parmesan, lemon zest, lemon juice, tarragon and butter. Season to taste with salt and pepper. In a large skillet, heat 1/2 cup of oil until shimmering. Pat the scallops dry and season with salt and pepper. Add the scallops to the skillet and cook over high heat until browned on the bottom, about 3 minutes. Add the butter to the skillet. Turn the scallops over and cook just until white throughout, 2 minutes longer. To serve: Plate the risotto into four bowls, top each with three of the seared scallops. Serve immediately. 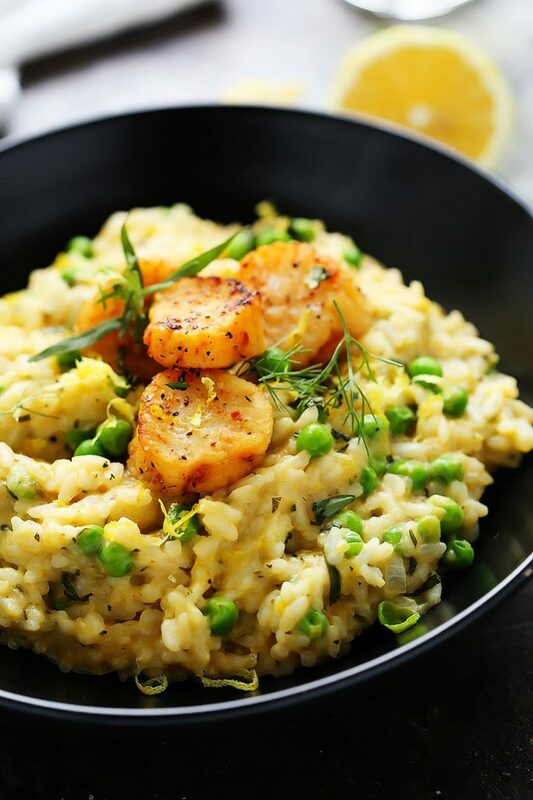 An unoaked Chardonnay would be perfect with this risotto and scallops – It’s butteriness and hints of citrus will pair very nicely. Pinot Gris has a nice acidity will cut through the richness of the dish and help to brighten the citrus flavor even further. Sparkling wine has an effervescence that mingles nicely with the rich, creamy flavors of the risotto. Here are some budget friendly sparkling wine options. Looking for more scallop recipes? Try these Seared Scallops with Fennel & Blood Orange. Ohmygosh! Can I come for some risotto? I am going to set my husband up to make this (i can’t cook while entertaining the babe) thanks for making my stomach growl so early today! I hope you love it as much as I did Michelle! Um…I’m coming to your place for dinner!! I love scallops and this sounds amazing! 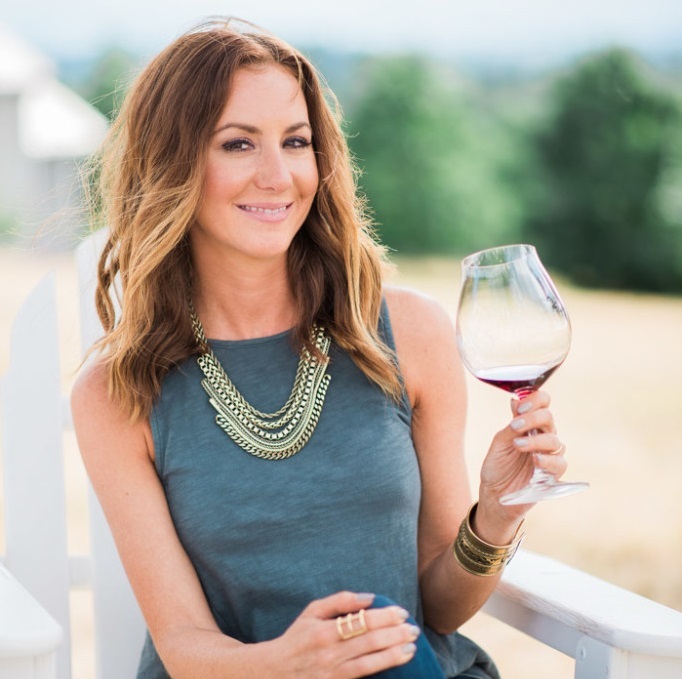 Thanks so much Kathryn – You are welcome anytime you’re in Oregon! These look amazing! 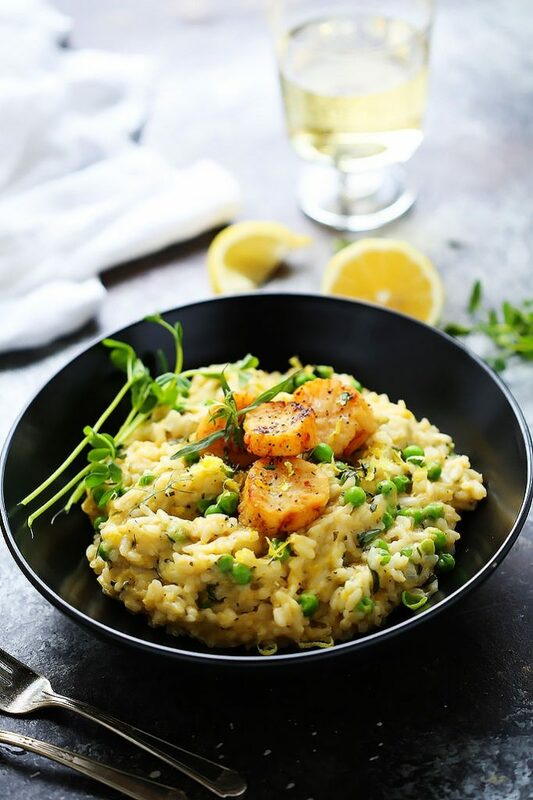 Sea scallops and risotto together is one of my favorite pairings! This definitely looks like a romantic meal. The risotto looks amazing with the scallops. Hi Erin, love this. Would you like to share this with the other participants in Food on Friday over at Carole’s Chatter? I have a weekly link up party – each week there is a different ingredient or theme. The current theme is Scallops! Hey Erin, When you say 1 1/w cups chopped leek & 1/w cup grated fresh parmesan cheese, did you mean to right 1/2? Thanks! Yes, I did. Thanks for catching that Ashley! 1 1/2 cups leek and 1/2 cup parmesan.